photography | Live Healthy S.C.
Do you love the beauty of South Carolina’s coast? Do you have a talent for capturing that beauty through a camera lens? Then we want to see your best work! 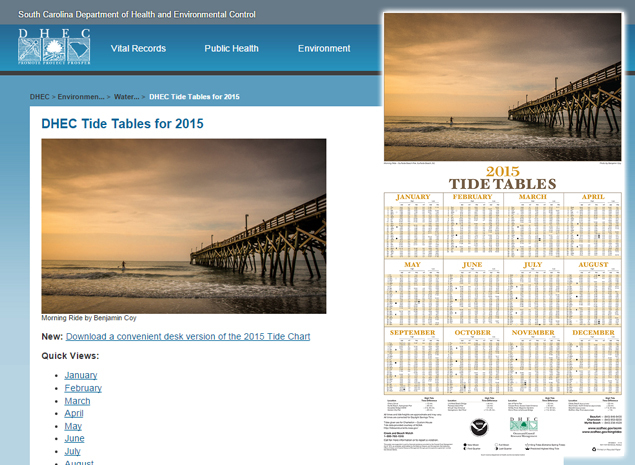 The winning photo will appear on DHEC’s 2018 annual tide table poster, of which over 12,000 copies are produced and distributed. DHEC is looking for coastal South Carolina scenes including marshes, beaches or wildlife. The 2017 winner “Ghost Crab at Sunrise” is shown above. The winner will be announced in October. For questions about the contest, contact Liz Hartje, Coastal Projects Manager, at hartjeen@dhec.sc.gov or 843-953-9237. This entry was posted in Environment, Ocean and Coastal Resource Management and tagged contest, photography, South Carolina Coast, Tide calendar, Tide tables on August 14, 2017 by SC DHEC.